Dimitar Nikolov, a versatile conductor, pianist, and educator, has conducted orchestra and opera performances in the United States and Europe. Audiences have been impressed by his ability to energize the orchestra and to produce unique sound within large dynamic range. 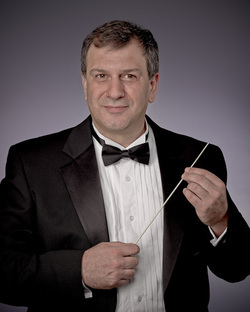 He has held conducting positions in United States (The Fort Dodge Symphony and the Des Moines Metro Opera) and Bulgaria (Burgas Philharmonic, Schumen Symphony Orchestra, Bulgarian National Wind Symphony, and Burgas Opera). Mr. Nikolov has appeared as guest conductor with orchestras in United States, Austria, Bulgaria, Italy, Russia, Romania, and Ukraine. Dimitar Nikolov began his professional career in 1991 as a Korepetitor (Assistant Conductor) in the Burgas State Opera. Early in his career he had the opportunity to conduct one of the best European orchestras, the Vienna Chamber Orchestra. This success led to numerous guest conducting opportunities offered by most of the Bulgarian orchestras. He was also appointed Music Director of the Bulgarian National Wind Symphony. In 1996 Dimitar moved to the United States. He finished his Masters at the University of Northern Iowa. During his studies he was an assistant conductor for the University Orchestras and the opera programs. In 2001 Dimitar Nikolov was appointed Music Director of The Fort Dodge Symphony and Assistant Conductor of Des Moines Metro Opera. More recently he spent time conducting professionally in his native country Bulgaria and appeared as guest conductor with East Coast Orchestras (Newark Symphony, Avanti Orchestra, etc.) and with orchestras in Russia, Romania, and Ukraine. Dimitar Nikolov has studied with many eminent conductors. In 1991 he had the rare opportunity to be selected by the legendary teacher Ilya Moussine to participate in his last workshop. As a Fellow Conductor at the Aspen Music Festival he had the opportunity to study with David Zinman, James Levine, Murry Sidlin, Alan Gilbert, and Yury Temirkanov. He has also studied with Gustav Meier, Diane Wittry, Rebecca Burkhardt, Tylor White, and Ivan Bakalov. Dimitar Nikolov is also active as a choral conductor, concert pianist, and educator. He is currently the Music Director of the Washington International Chorus. He has also previously conducted the Waldorf College Women’s Chorus and the Des Moines Choir. Dimitar is performing solo and chamber music recitals in Baltimore/Washington area and in Bulgaria. He has appeared as a soloist with American and Bulgarian orchestras. Dr. Nikolov enjoys teaching young students and has been on the faculty of Catholic University, Simpson College, Waldorf College, International School of Music, and the Bulgarian National Academy of Music. Dimitar lives in Maryland with his wife Nicole, Princess (an adorable cocker spaniel), Mecho (overenergized American Eskimo), and O’Malley (old and distinguished Himalayan cat). For more information, visit www.dimitar-nikolov.com.